After announcing their new premium line of Galaxy Tablets to the world last month in New York, Samsung Australia has today opened up about their plans for the tablets here in Australia. While the tablets will be released in Wi-Fi as well as 4G versions, only the WiFi models will go on-sale on the 14th of July. The WiFi models will be available for pre-order from the Samsung Experience Stores in Melbourne and Sydney, as well as online through the Samsung E-store. 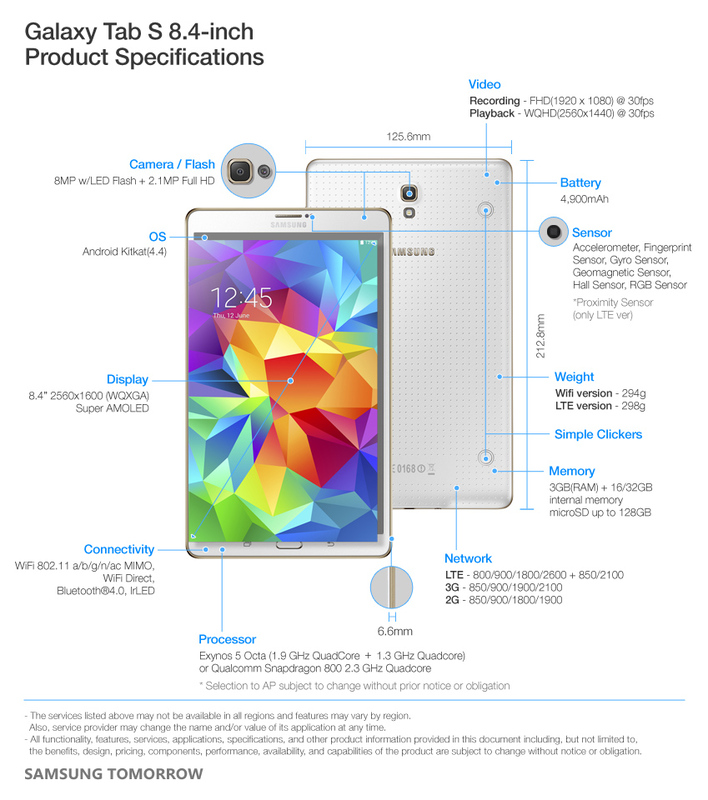 The Galaxy Tab S series both come with an incredible 2560×1600(WQXGA) Super AMOLED display, with a 100,000:1 contrast ratio at a 16:10 aspect ratio in a choice of 8.4″ or 10.5″. The Super AMOLED display will help to deliver an extremely rich experience for customers using a technology called Adaptive Display, which ‘delivers rich colours, deep blacks and crisp pictures’. Light and thin, the Galaxy Tab S series measures in at just 6.6mm thick and weighs a little over 290 grams for the 8.4″ model and just over 460 grams for the 10.5″, making it an extremely portable device. But as thin as it is, Samsung expects owners to get around 11 hours of video playback from the battery included in the tablet. The Galaxy Tab S is a carry-on from their premium Galaxy S line of phones and carries many of the design stylings, as well as features of the flagship phone. The Galaxy Tab S includes fingerprint scanner and dimpled rear of the phone. Software wise, the Samsung Galaxy Tab S runs Android 4.4 and includes a number of tablet specific inclusions such as Side Sync 3.0, multi-user mode (with Kids Mode) and multi-tasking. Side Sync 3.0 allows you to connect to and operate your Galaxy S5 phone directly from the tablet, an interesting use case for people invested in the Samsung Galaxy eco-system. 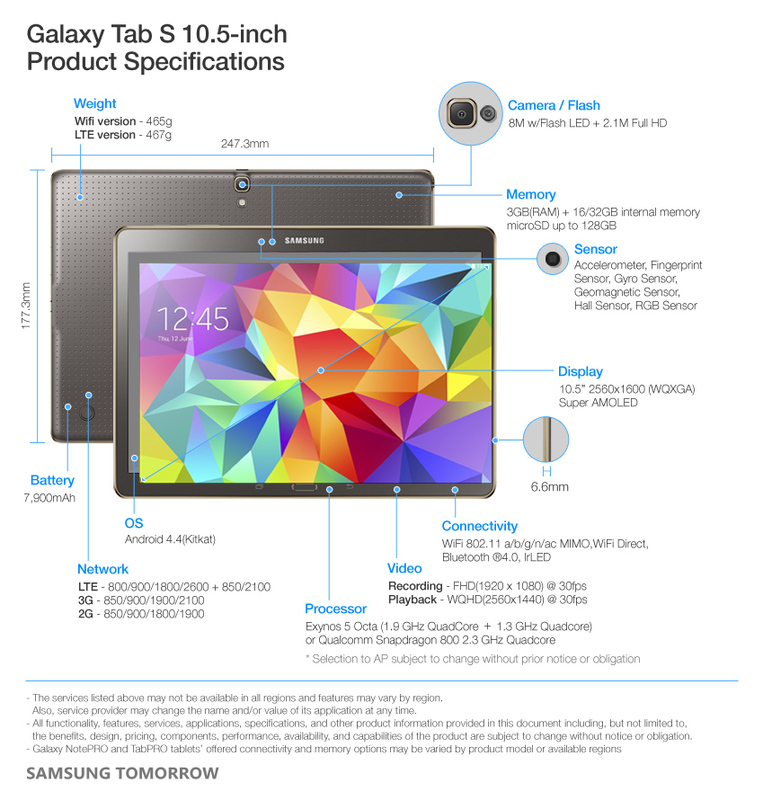 The Galaxy Tab S series also comes with an array of free content from Samsung which is being delivered through Google Play including a range of magazines, as well as the hit movie Gravity, starring Sandra Bullock. There’s also a host of games and books included which you’ll find in your My Library when you purchase the tablet. We look forward to spending some time with the Galaxy Tab S series and hope to bring you a review soon. Huh, no 32 gb + LTE? I get a little confused with their naming of tablets… does this have an S-Pen? Looking forward to your review. I’ve been looking for a good quality hi-res 8″ tablet which works well in sunny outdoors. Perhaps this is it! The Samsung website lists all versions of the Tab S as not having DLNA support. I checked the US site in case it was dodgy info in the AU site, and it doesn’t mention DLNA at all.. I thought that DLNA was pretty standard fare on pretty much every device nowadays.. I would go with the DLNA being present – it’s only software and plenty of Apps on Google Play can fill in if not. Will Samsung actually release the 32gb version, or will they only ship the 16gb version as they usually do for the Australian market. There are no 32Gb 4G versions available. CAT S61 — Australian Review · 48 mins ago.